Moist and full of apples and real cranberries, these grain-free muffins are a healthy start to the day or snack. The unusual combination of pumpkin and cheese puts a savory fall twist on quesadillas. Summer is officially halfway underway. Make the most of the rest of your summer with these fun, healthy snacks for kids. Organic apple slices are filled with almond butter and granola and sandwiched together for one super healthy and super delicious snack. Need an easily customizable snack? This simple Triscuit pizza is perfect for weekday snacking. Never buy store-bought grahams again after making this easy version right in your own kitchen. 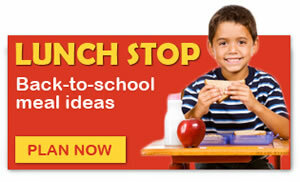 Kids ravenous after school? Here are three fun snack ideas to keep them happy. Fresh apples and a variety of toppings make these little dippers a super healthy and yummy way for kids to eat healthy. When it comes to your favorite go-to foods, the only way to make them better is to enjoy them bite-sized! Turn those tiny hands into helping hands with these simple recipes your kids can make for themselves! Start your party off with Fat Tuesday treats that the whole family can enjoy! Snack recipes, tips and ideas every ChefMom needs to keep her family fueled for the day.